Next up is Will, our social care specialist – aka, "The Socially Devoted Guy.” He’s going to look at how Olympians will be engaging with their audience this year, and on whether tweeting or posting can negatively (or positively) impact athlete performance. Remember the London Games’ Australian swim team debacle? And bringing up the rear is Sharise. She’s going to look at the Brands that advertise and whether they attract the Follower buzz as much as the advertisers in the Super Bowl do. You can be part of the Olympic coverage too. Every time you root, err, tweet for your favorite sport, athlete or brand, you’re a part of millions of social conversations from around the world. 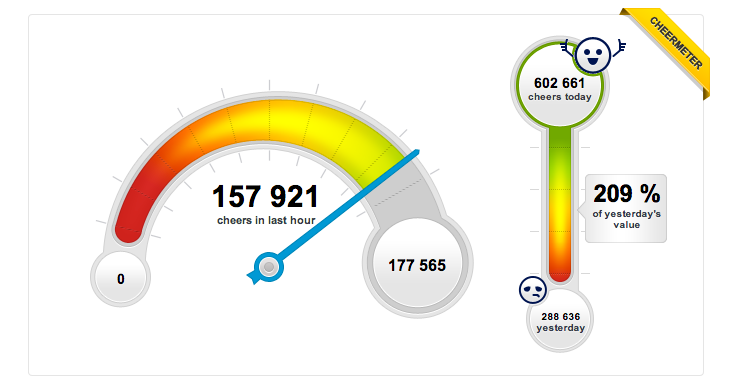 Our CheerMeter will track selected athletes, sports and Brands that are generating buzz. To participate, just tweet your heart out on Twitter, then check our CheerMeter throughout the Games and see who’s winning the Gold in social. Social media has changed the rules of how the world gets published, and publicized. The Olympic Games have not been exempt, despite new rules and debate on the use of social media during Olympic events. With every turn at the Summer and Winter Games, social media has grown in influence, mediating the public’s impression of the Games, athletes and host countries. As with all brands, the rules of steering the conversation with compelling content and engagement apply. And the Olympic Games have wasted little time gearing their content for Sochi. Beginning in early 2013, the Games have used Facebook to quarry excitement and interest on the platform. 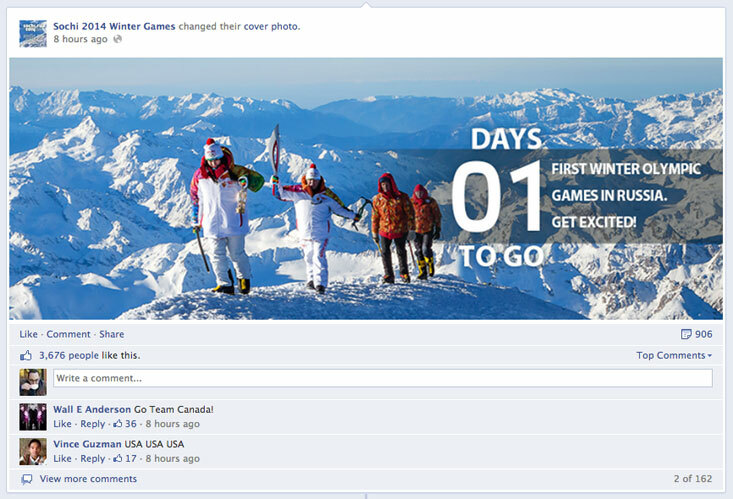 A quick perusal of the Sochi 2014 Winter Games Page is enough to see a highly active campaign. Virtually every post contains an image, concise and energetic copy, and invites readers to follow the conversation with hashtags and links to related content. Despite the controversies of social media in the Winter Games—from journalists’ coverage to usage by athletes and conditions in Sochi—there is strong need to keep the conversation focused on competitions and engaged audiences. 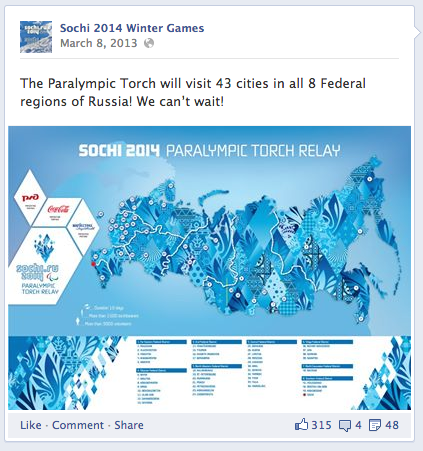 As the Games in Sochi get underway, we can't help but notice that this time around, they're getting more social. 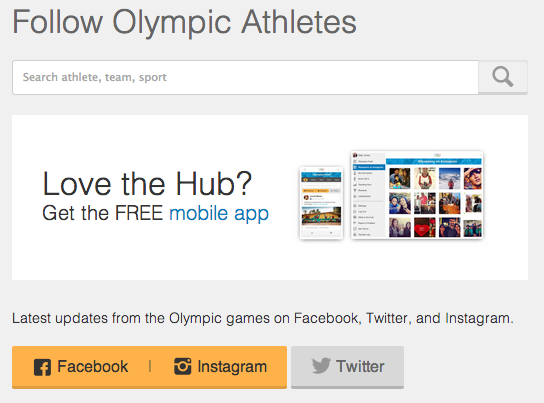 With a new online and mobile app, the Olympic organization has created a way for you to interact with over 5,000 of your favorite athletes and stars, by linking their Twitter and Instagram feeds together in one giant "hub.” However, if you want to see how much buzz athletes are creating across the web, along with many other cool social stats, you should come back and take a look at our CheerMeter! Another tantalizing promise made by the organization was to have many of the athletes participate in live-chats with fans via Twitter. Indeed, the Australian Olympic team already got a headstart with a live chat a few weeks ago. However, this may be to make up for the unpopular announcement, made last month, that the Australian team would be banned from social media during the actual competition. Perhaps it will help them concentrate more on their sport (as the officials claim), but on the downside – how will they rally their Fans and Followers?! At Socialbakers, we always believe in reaching out to your audience, whether they are Fans or merely fans, and engaging in a two-way #SociallyDevoted dialogue. Apps and live-chats like these create a new kind of connection with the athletes and their followers. We’d absolutely love to see more if this in the future! According to a just-published story by World Screen based on a Twitter study, Hashtags in TV ads drive positive brand conversation. And "a viewer who tweets while watching TV is less likely to change the channel during the commercial breaks." With events like the Super Bowl, the ads are part of the show and most viewers look forward to them. While the Olympics may not have quite the same reputation for advertising, it’s still not likely that anyone will change the channel for fear of missing an event. Hyundai and Coca-Cola were both advertisers in the Super Bowl. Although Coke is downplaying its Olympic ad efforts in the United States, they’re making a pretty big deal of their participation in and around Russia. They already created a bit of outrage from many Americans who didn’t like their non-English rendition of America the Beautiful ad during the Bowl. Could they be risking tarnishing their brand even further on home soil by over-promotion in Russia? Only time will tell, and we’ll be watching the social media scores to find out. But back to the Super Bowl vs. the Olympics, should be interesting to see which sporting event awards these two (and all) advertisers with more Fan and Follower medals. Come back after the games for a follow-up review of the numbers. But remember to join the conversations on Twitter and visit our CheerMeter during the games to find out who’s on the leaderboard.